Find the Best Banquet Halls in Los Angeles, California Here! Before you set the date for your big day, or start calling all the banquet halls around or ballrooms to see whats their availability. Some halls tend to fill up over a year in advance, so the hall is the first thing you need to finalize before doing any other wedding planning. Banquet halls are great for Weddings, Engagement Parties, Baby Showers, Birthdays, Quinceaneras, Bar & Bat Mitzvahs, Graduation Parties, and even Corporate Events! Browse our comprehensive list of banquet halls and reception sites located in Los Angeles, Glendale, North Hollywood, Burbank, Studio City, Pasadena and More! When You Step Inside The Mirage Banquet Hall, you leave the ordinary outside world behind as you enter a lavish dream. If you are looking to hold your special event at a one of the premier Banquet Halls in Los Angeles, or a wedding hall in Los Angeles, you don’t have to go any further than North Hollywood! Pure Banquet Hall is a modern white wonderland, one of the most unique banquet halls in Los Angeles. Located in Lake Balboa in the heart of the San Fernando Valley. Capacity of up to 200 Guests. Metropol’s Millennium Ballroom is a newly constructed venue which opened in April 2014 that blends modern amenities with classic, imperial decoration. The modern architecture starts in the stunning foyer, featuring white marble floors and a gorgeous State of the Art LED & Moving Head Lighting System Installed by Allen Productions – www.allen.dj one of the leading Lighting Installation Companies in Southern California. Bellaire Banquet Hall is located in the heart of North Hollywood. We are one of the few venues in the world to offer a Live Fish aquarium dance floor! Yes, you heard correctly, Bellaire Banquet Hall consists of a Live aquarium Dance Floor with over 250 large & small Koi fish! One of Los Angeles’ Latest banquet halls, which started operations in fall 2012. Our ballroom is perfect for wedding receptions, utilizing modern décor to create a unique atmosphere that is elegant, and alluring. 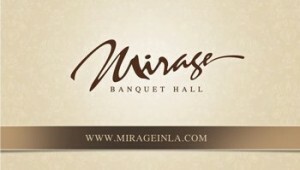 Unlike any other Los angeles banquet halls, here is a place were memories are made.